Order your own copy of The March on Winterfell at your local retailer or online through our website today! The winds of winter begin to blow across Westeros, bringing with them death and the threat of long-forgotten horrors rising in the cold. At the Wall, Jon Snow is torn between his duty and his humanity. In King’s Landing, Cersei Lannister struggles to hold onto the loyalties of the smallfolk as the Tyrells and the Faith Militant divide them. And in Essos, Daenerys Targaryen attempts to establish a lasting rule in Meereen while the Sons of the Harpy plot her downfall. As the sun threatens to set on these characters, they must test the demands of their morality and ask how much humanity are they willing to lose to gain power and ascend the Iron Throne. 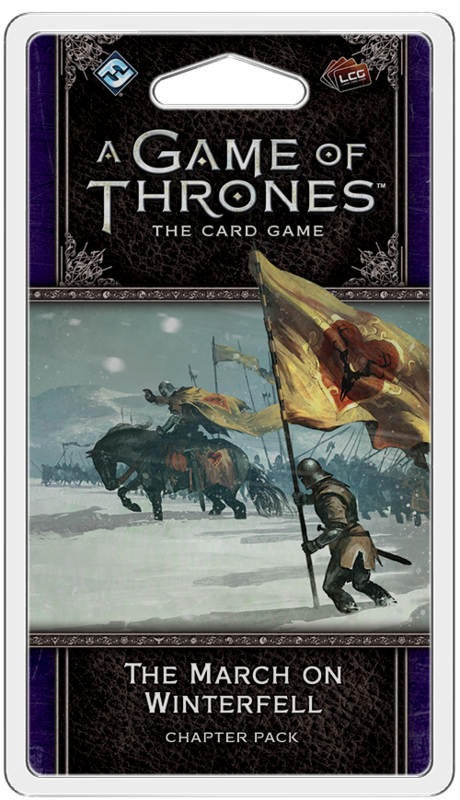 The March on Winterfell, the second Chapter Pack in the Dance of Shadows cycle for A Game of Thrones: The Card Game, is on sale now at your local retailer or online through our website! The March on Winterfell draws you into the pages of A Dance with Dragons, where the key players in the game of thrones are surrounded by enemies on all sides. The only way to survive is to embrace the shadows that shield these foes. 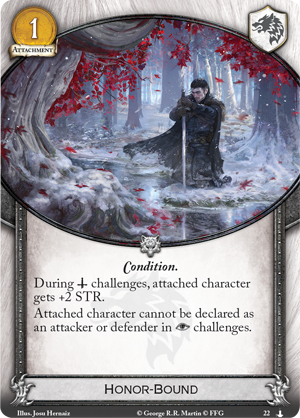 Throughout the Dance of Shadows cycle, you will see the reintroduction of the shadow mechanic from the first edition of A Game of Thrones: The Card Game. Shadow creates a new, separate area for you to store some of your most duplicitous cards—a place protected from effects that target your hand and board. For the low cost of two gold, you may hide your cards with the shadow (x) keyword facedown in shadows. Later, you can spring them into play by paying their shadow cost, snapping your trap shut before your opponent even realizes what's happening. If you wish to build a deck around this keyword, you will need to step into the darkness with the cycle's new locations that offer you with plenty of places to hide and plot your schemes. 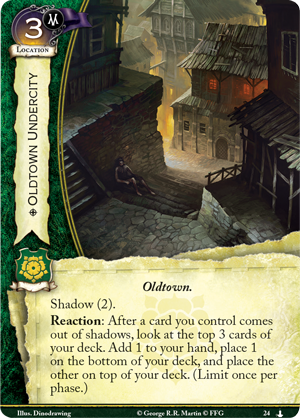 The Oldtown Undercity (The March on Winterfell, 24) offers you a new level of control over your deck and the cards that you have at your disposal. With a shadow cost of two, it is a small matter to keep this location tucked away as an extra level of security until you need to change course and set your enemy off-balance. With this location on the board, after you bring a card out of shadows, you can look at the top three cards of your deck, bringing one to your hand, one to the bottom of your deck, and the other to the top of it. Thus, you can lay your schemes in order, carefully compiling the tools that you need to strike at the Iron Throne. 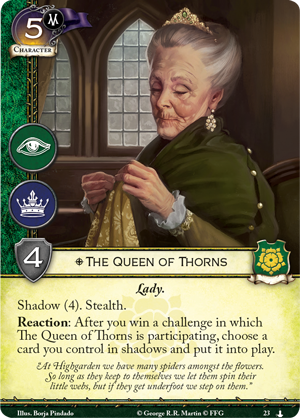 Of course, if you have The Queen of Thorns (The March on Winterfell, 23) in play, you can use the Oldtown Undercity even more efficiently, constantly shifting your plans and adapting to any challenge your opponent presents. 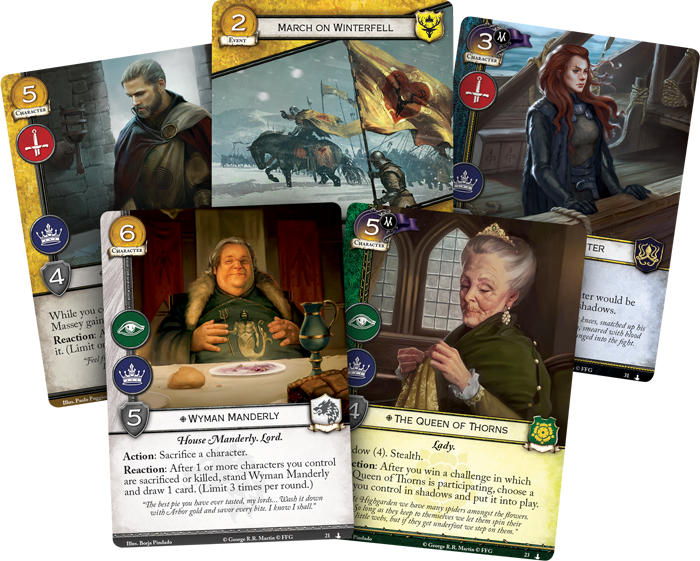 Beyond returning to the realm of shadow and deceit, The March on Winterfell offers a variety of cards to appeal to players who value honesty and loyalty above all. You don't need to spin the webs of deceit that your rivals may soon tangle themselves in. 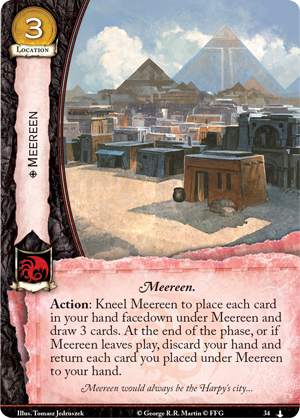 If you align with House Targaryen, you may use the twisted alleys of Meereen (The March on Winterfell, 34) to hide and protect your most precious cards, to potentialy draw more burn events, or to fill your hand with cards you can discard for powerful effects. Alternatively, you may use honor as your sword and your shield with Honor-Bound (The March on Winterfell, 22). In keeping faith with the Stark themes of direct, open confrontation, this attachement rewards you for denying the call of southron intrigues altogether. During military challenges, an Honor-Bound character gains increased STR, but they cannot be declared as an attacker or defender in intrigue challenges. 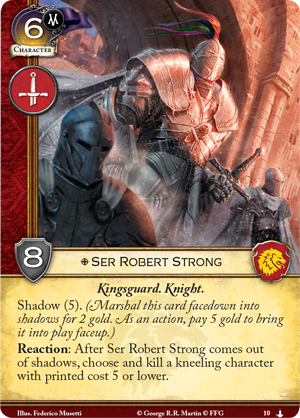 This bonus may be invaluable when you face faceless warriors like the mysterious Ser Robert Strong (The Shadow City, 10) on the battlefield. 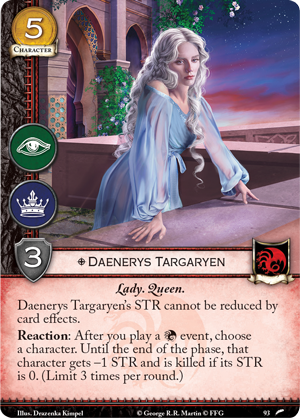 And of course, you can also play Honor-Bound on your opponent's characters, like Daenerys Targaryen (The Faith Militant, 93), to prevent them from participating in intrigue challenges. 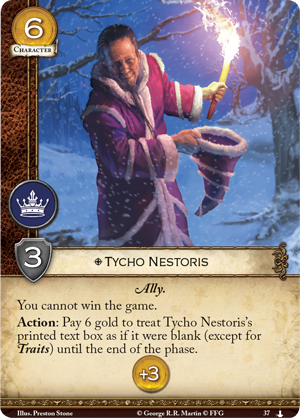 Yet perhaps the most honest character in all of A Game of Thrones: The Card Game is the opportunistic Tycho Nestoris (The March on Winterfell, 37). As a servant of the Iron Bank of Braavos, Tycho has no affiliation. What he does have is a massive +3 gold modifier—enough to play at least one card into shadow each round, with more left over to add to the income of your plot card. But while this increased economy can dramatically accelerate your economy, such power comes with a price. 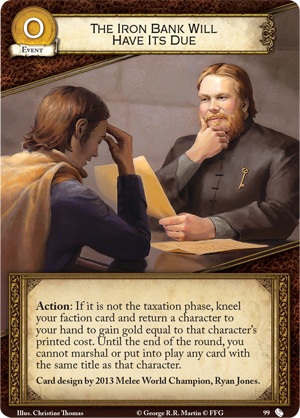 When Tycho joins your ranks, you cannot win the game until your loan has been paid, with interest, by paying six gold to blank his text box until the end of the phase. Of course, if gathering the funds to repay your debt presents too much of a challenge, you may simply play The Iron Bank Will Have Its Due (Oberyn's Revenge, 99), immediately returning Tycho to your hand and leaving you free to reach victory! The snows bury the North, leaving the common folk isolated without aid and entire armies stranded, forced to feast on horses. Do you have the strength to survive, or will you fall before the elements and your foes? Learn to live in shadows, call your banners, and prepare to march! Pick up your copy of The March on Winterfell (GT32) at your local retailer today or on the Fantasy Flight Games website here!